The questions surrounding Ricky Martin's sexual orientation have been floating around for years. I've been wanting him on the LGBT team for years now. My reasons for wanting him to come out are not because I want him to be comfortable with who he really is. It's not because I feel he may be struggling with issues of self-esteem or self-worth and coming out will help. 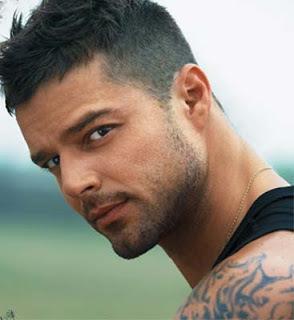 I want Ricky to come out simply because - well, just look at him. He would represent us sooooo very well. And I think he could be my next husband. Well it looks like Ricky just may be ready to make those steps out of the closet. In an interview with TV Aqui magazine he didn't exactly kick down the closet door and coming screaming out but he did open the door and look around a little. Ricky stated to the editor of the magazine his heart could belong to either a male or a female. If his heart can belong to a man or a woman then I guess he hasn't been lying all those times he's denied his homosexuality. So I guess Ricky is bisexual. Yeah - that's it. I think I'm gonna be bisexual too. But seriously - good for you Mr. Martin. If baby steps are what you need to come out then by all means take baby steps. I don't want to force you to do anything you don't want to do. Just know that when you're ready, I'll be here waiting.